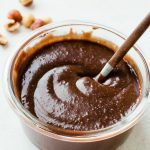 Put hazelnuts in a food processor and mix until finely ground - as ground as possible. Add the honey, oil and salt and mix until it resembles a marzipan-like paste. It should be a bit grainy. In a medium heat-proof bowl put chocolate, cream, sugar, and cocoa powder. Melt in the microwave or in a bowl set over a saucepan with simmering water. Add half of the chcoolate mixture to the food processor and mix until combined. Add the rest of the chocolate mixture, and process for one minute until well blended and creamy. The spread is a bit grainy because of the hazelnuts - that's how it should be. It would be soft at this point, but it will set once chilled. Pour mixture into a jar and keep in the fridge. Try not to eat it all at once! Keep for 1-2 weeks in the fridge.